Here are some observations after some time using it. Add -w2 flag to /echo, in case user is using emoticons/image tags. Support custom colors for own user nickname using On Input event and a little modification when checking if internal nick colors in enabled. In some network nicks can have multiple prefix (for instance Rizon), resulting in &@nick. To fix it you should get first prefix and append to nick, example: $left($nick(#,$nick,a,r).pnick,1) $+ $nick. Support for consecutive spaces could be implemented without much effort using $msgx, /var, /echox and /rawx in case of On Input. A new option to user select if hsl/rgb colors will surround only nick/pnick or whole $prefixuser. Example: <nick> VS <nick>. Now that /cline also has support for rgb colors, this could be implemented as optional. Add support to timestamp with space, important if nickcolumn is enabled. Maybe only way is replacing space by $chr(160)? Option to disable script in specific channels, useful for VERY high traffic channels (read XDCC), it can slowdown a bit the client. Support for "ignore timestamp for consecutive messages from the same nick", also a new AdiIRC feature in version 2.3. None of suggestions above are crucial, the script is almost perfect in current code. I implemented some of that changes for my own amusement. Just passed here to say thank you for this awesome color algorithm. Can't live without this feature anymore! Since author has not updated this script for a long time, I made a little fork to implemented all the nine suggestions from my previous post above and plus more changes listed bellow. Fixed on load error when creating the hastable (doesn't need to load after to make it). Implemented support for spaced timestamp and prefix user. Full support for consecutive spaces in message/action to send and receive. New Menu to disable script completely without unloading it. New Menu to disable script in specific channels. New menu to force Dark/Bright color or set to Auto (default as original script). Removed savereload command from On Options event because reset command already is calling it. Increase hashtable purge limit from 500 to 1000, no special reason. Reset hashtable rcolors on saving options only if bg color changed, this fixes saves hash table on exit. Tiny bonus, replace tab char by space char, making them "visible" in messages. (Example, when copy/paste a line from dcc transfers panel). Script is almost the same, not edited the most important that is the random color algorithm, I just improved it in overall a bit. Report bugs, I'm sure there is few one. Only feature I decided to not implement for now is the "Ignore timestamp for consecutive messages", in case someone request it I'll think about. Again, thank you to the original author for this awesome script. If you have "Color entire line" option in Nick Colors options category, or via the Command -> RGB Random Nick Colors -> Color Entire Message submenu, then the first word will not display as an emote image (if it is valid as being one). Thanks for the report, fixed in version 0.1.1 attached to previous post. v0.1.1 - Fixed emote as first word in messages. 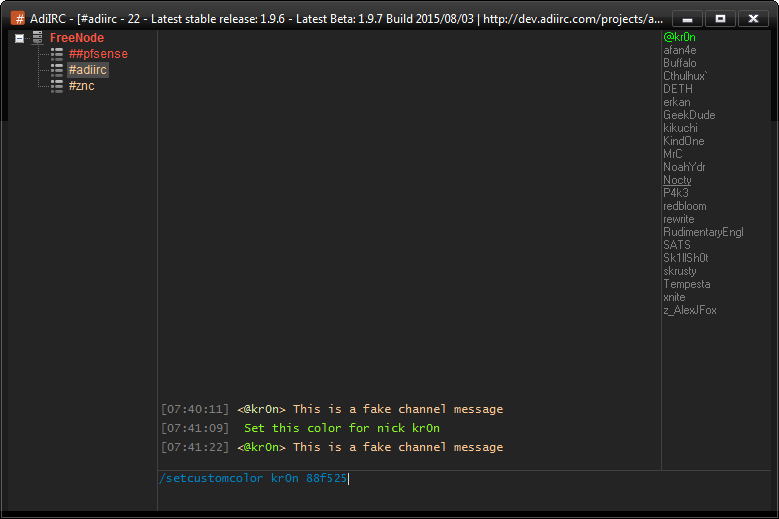 v0.1.2 - Make local /action to use standard emote color for timestamp and message. More small changes, my apologies. v0.1.3 - Removed unneeded echo flags for your own message. -r - Apply strip colors/bold/italic/underline options. << AdiIRC by default only apply this option for incoming messages. -l - Apply highlight options. << very annoying triggering a highlight in case you send your own nick. -m - This echo should be treated as a normal message. << The color in tree/switchbar to indicate of a new message, in this case will do nothing since target window already is the active one. -f - Apply flash options. << Also doesn't makes sense to flash for your own message. -b - Apply beep options. << Same case. v0.1.4 - On toggle On|Off script, make it update nicklist colors only if this option is enabled, since it may hang slightly if user is connected to a lot networks/channels. v0.1.5 - Changed "Color entire line" priority to follow user custom highlights color. I actually liked the actions (of myself and other users) being coloured all the same (as in your 0.1.1 version) instead of just the username being the unique colour. Is there anyway that you can make this an option? Alright, added action color as an option. v0.1.6 - New option to color entire emote messages (disabled by default). Check if new version fixes this issue, found another problem. v0.1.7 - Fix action message sending as regular message remotelly. 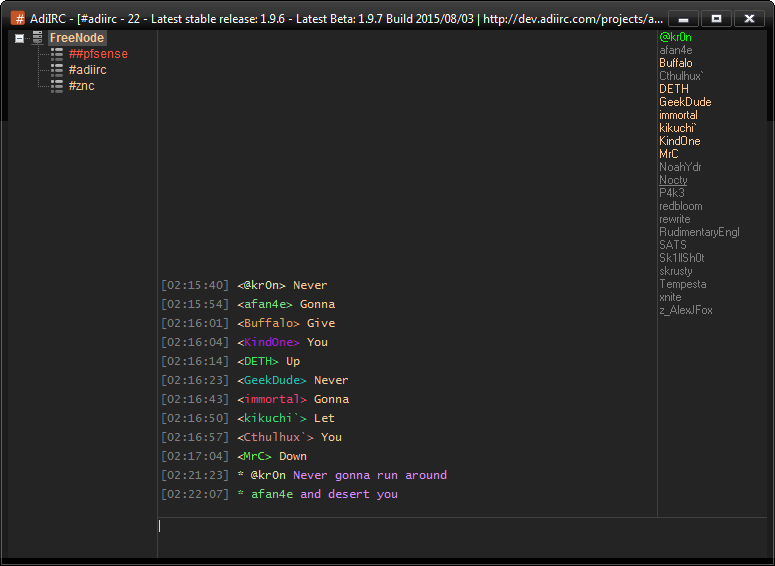 v0.1.8 - Fix ctrl+enter (send commands as normal message). What about making a new thread with the fork? Just learned some users don't read past the first post. Just now, my nicklist colors seem to be different from the chat colors.... sometimes by a small shade, othertimes by quite a bit. TwitchTV allows the user to set a custom colour for their username... what is the easiest way to use this colour for their username/message instead of autogenerating one for them? As you can see, the colour is given as HEX, so how easy is it to drag that value instead of the autogenerating? ; if $msgtags contains the "color tag"
You could try /cline -b, but I don't think I have added something to convert hex into decimal or rgb yet. Just having a method of being able to use the value that is stored in the rcustomcolor file would be handy. I added $hexcolor for next beta.